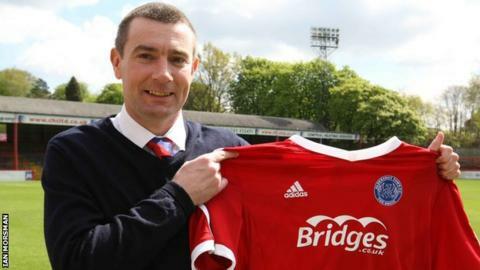 Aldershot Town have appointed former Dundee and Alloa Athletic boss Barry Smith as their new manager on a one-year rolling contract. The 41-year-old has been out of work since leaving Alloa in March. Chris Barker, who has been in caretaker charge since Andy Scott was sacked in January, will remain with the Shots as player-assistant manager. "Barry is ambitious and has great experience of developing young players," said chairman Shahid Azeem. Smith began his playing career at Celtic and then spent 11 years at Dundee, captaining the side between 1997 and 2006. He returned to Dens Park as manager in 2010 and spent almost two and a half years in charge before parting company with the club in February 2013. He was appointed Alloa manager in January 2014 but resigned last month, with the Wasps bottom of the Scottish Championship following a run of one win in 13 league matches. "I see Aldershot as a great club with the same aspirations as myself. It felt an ideal fit," he said. "We are looking to build a new squad and we have to build slowly. Ultimately we want to take the club back to the Football League." Centre-back Barker, 35, won five of his 15 games in charge of the Hampshire side and led the Shots to an 18th-placed finish in the table.